Grab Hire in Birmingham and The West Midlands originates from our main depot and Head Office in Wolverhampton. Being so close to your project, site or area of operation means that we can speedily and efficiently supply you with the grab hire vehicle you need, when you need it. Due to our flexibility of hire contracts and attention to customer service, we are the first choice for grab hire in Birmingham. Through our affiliation to bodies within the fleet and construction vehicle industry, we are committed to the highest standards of safety and responsibility for grab hire in Birmingham. Through the Fleet Operator Recognition Scheme, we have SOCA accreditation, meeting their standards of safety, fuel efficiency, emissions, and operations. Being a Construction Logistics and Community Safety (CLOCS) champion we are part of an active industry group heavily involved in promoting high standards of safety and best practice in relation to vulnerable road users. You can download any of our vehicle specification sheets to make sure you get exactly the right vehicle for your project. Our Health and Safety policy and ISO 9001, 18001, 14001 certificates are also available to view and indicate the high standards for our HGV hire. Search our website to find the right vehicle for your grab hire in Birmingham and the West Midlands. From 7.5 tonne to eight wheel, 32 tonne grab hire options, we have the right tipper grab for your project requirements. Ideal for the of delivery of heavy loads like stone, gravel and soil. 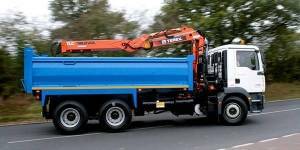 They are also efficient “muck away” vehicles, perfect for removing large scale non hazardous waste off site. Choose ND Brown for your grab hire in Birmingham solution. With short and long term hires, vehicle collection and delivery, and high standards of safety and customer service. Contact us to discuss your requirements and to get a quote from us.